The Documentation Centre on Elections and Democracy (CDED) continued to function and expand. The Centre's database registered around 500 titles by the end of 208. The Centre has received an average of two visitors a day, mainly from the university community, with attendance peaking during specific periods of academic activity, such as exams and dissertation writing. The full-time librarian assigned to the Centre was responsible for all acquisitions and management of the Centre. The Centre provided increased public access to quality and updated knowledge and information on democracy, governance and electoral processes. The Centre acquired more than 500 titles with more than 500 users accessing this information. EISA finalised the setting up of the Documentation Centre on Elections and Democracy (CDED), namely furnishing it, putting in place the necessary IT infrastructure and software and acquiring materials, such as books, reports, magazines, journals and other documents. The CDED was officially jointly inaugurated by the Vice-Chancellor of Instituto Superior de Ciências e Tecnologia de Moçambique (ISCTEM) and Chair of the National Elections Commission (CNE), Professor João Leopoldo da Costa, and the EISA Country Director for Mozambique, Miguel de Brito, in July 2007. The CDED has produced its first catalogue of available documentation which has been distributed to all higher learning and research institutions in Maputo. The Centre also requested those institutions to send copies of reports and publications produced by them on issues of democracy, governance and elections. At the end of 2007 the CDED held more than 400 titles. In 2006, an agreement was signed with the Higher Institute of Science and Technology of Mozambique (SCTEM), a private University, to host the Centre and eventually take over its management. Equipment and furniture for the Centre were purchased and the first set of publications were aquired. A librarian was hired and trained and began to develop a database for the Centre. 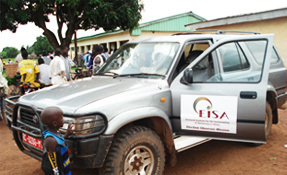 In 2005 a third component was added to EISA Mozambique's work - to promote knowledge and debate on elections, governance and democracy through the establishment of a documentation centre. The establishment of a documentation centre had three main objectives: to create a specialised centre on elections and democracy where students, political parties, reserchers and the public in general can find up-to-date literature and documentation; to encourage new research and, knowledge and publications; and to promote public debate on key democracy issues in Mozambique.